Despite terrorist attacks in Tunisia that killed 21 people days earlier, the World Social Forum was held in Tunisia for the second time in March. On the first day of the event – a rainy day that soaked the city – social movements gathered in solidarity with the victims of the attack and to protest neoliberal globalization and to demand their dignity and human rights. 50,000 people, from 130 countries, participated. The first WSF, held in 2001, fueled a global movement towards constructing alternatives to neoliberal politics. At this year’s WSF, participants discussed the Palestinian struggle, the participation of civil society in democracies, freedom of the internet, systems of communication, as well as racism, xenophobia and reparations. Watch activites here. 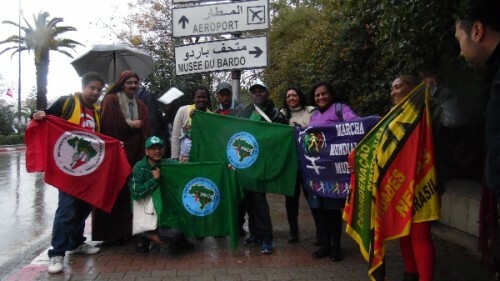 Three delegates from the Brazilian waste pickers’ movement (MNCR) participated in the WSF. They contributed towards discussions around the agendas: water, planet, and people. The main debate was around water management, especially of rainwater, which is disappearing from our cities as the water cycle stops functioning. The debate around water will continue at the COP20 in Paris this year. The MNCR delegates also participated in a debate about socially inclusive recycling and the rights of waste pickers. They were even able to visit an association of waste pickers in Tunisia. We asked for the participation of these waste pickers at COP20 and the global meeting of waste pickers, to be held in Brazil in 2016. Access the complete article (in Portuguese).